I absolutely wasn’t going to jump into Halloween! I thought of The Wicked Witch of The West from the Wizard of Oz and then I saw the picture below and these Melted Wicked Witches of the West were born! It is such a fun concept. The kids will eat them up!! This will truly be the highlight of any Halloween Party for kids as well as for adults. Remember the line: “I’m melting, I’m melting!” Oh yes, indeed!!! 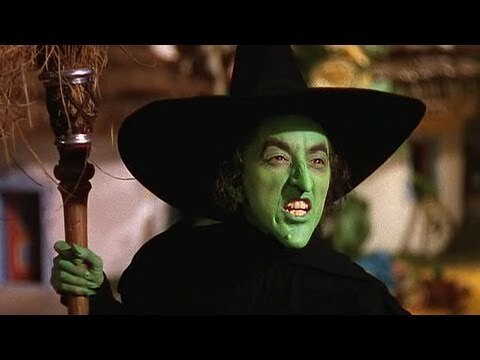 You can make the Wicked Witch goo by melting green candy melts and dark chocolate candy melts separately in the microwave. You won’t need much of the dark chocolate candy melts. A bag of the green candy melts made about 2 dozen of these melted wicked witches and as you can see from the picture, you just need to drizzle the dark chocolate in to make it look interesting — maybe give it a gentle swirl. Do you see the witches hat and broom? You’re going to want to make those first before melting the candy melts. I guess I better stop dreaming about these gooy witches and get down to business. To make the wicked witch’s hat you’ll need half an Oreo cookie and stick a Hershey’s Kiss on the non-filling side of the cookie. These you can make after you melt the candy melts and made your green gooy globs on a large cookie sheet covered with wax paper. I’d go with a little bit larger size than a regular cookie — maybe a cookie and a half size — especially if you want to put these in ziplock bags for Halloween Party Favors. To make the witch’s broom you’ll flatten the yellow taffy and cut it in half horizonally, then cut the the broom fringe with sharp scissors and attach the non-fringed side of the broom bristles to a pretzel stick. All right, you got your brooms made, right? You’ve melted your green and dark chocolate melts in separate bowls, right? You put wax paper on a large cookie sheet, right? Spoon a nice generous amount of green candy melts onto the cookie sheet, trying to keep it in a neat circle. 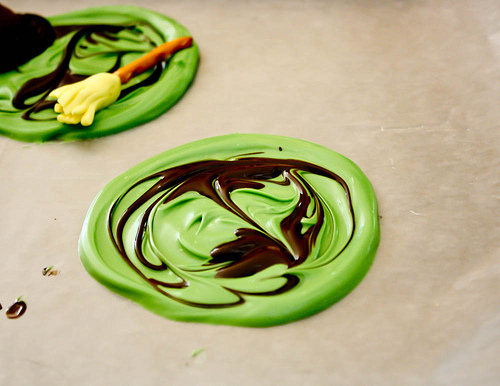 Drizzle the dark chocolate into the green goo and give it a swirl with a toothpick or butter knife. Separate an Oreo Cookie and put the frosting side into the green goo to the left edge. Add an unwrapped candy kiss dipped into the melted dark chocolate candy melt and attach to the center of the Oreo Cookie. Now put your pretzel broom into the green goo to the right. There you have it! Continue the process until all of your Melted Wicked Witches of the West are complete and set in the refrigerator to cool. I’m sure you’ll get the feel of making these in no time. You could be making quite a few of these once you get started. Have fun!!! August is almost over. September is within sight. My thoughts turn to apples and all the great fall recipes. Bet you thought the subtitle was going to rhyme. Sorry, not a poet. It’s just a statement. Trying not to jump into Halloween. I’ve been doing quite a bit of that lately. Wouldn’t these cookies go great with vanilla ice cream? I know I’m a bit boring when it comes to pies and ice cream. I go for the very traditional. My mother was always baking pies. She got it from her mother. So, it’s a tradition. And that tradition isn’t following a recipe. You just “know.” I cheat . . . I taste. I’m not claiming to be the pie maker like my mother nor my grandmother. I at least don’t get “that look” when my mother would ask, “What kind of pie would you like?” I don’t know why she’d give me “that look,” she knew before she asked what I’d say . . . apple. And my brother had his favorite: Lemon Meringue. So, my mother was left to decide for herself. Of course, she baked all kinds of fruit pies . . . but your favorite was always your favorite. Spray cookie sheet with non-stick spray and set aside. Dust work area with flour and roll out crusts. One is for the cookie and the other is for the lattice on the top of the cookie. Using one crust, cut out circles for the cookies. Spread a thin layer of caramel on these cookie disks. Cut the pie filling into smaller pieces and spread over the top of the caramel. Cut the other crust into 1/2 inch strips. 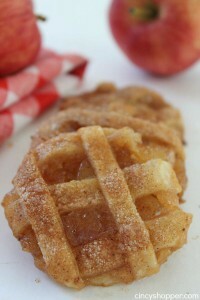 You’re going to use these strips to create a lattice over the apple filling. Once you’ve created the lattice over your cookies, transfer them to the prepared cookie sheet. Beat the egg in a bowl until well blended. In another bowl mix together the sugar, cinnamon and nutmeg. There you are . . . they’re as delicious as they are lovely to the eye. Please leave me a comment about these great cookies. Do you believe it? 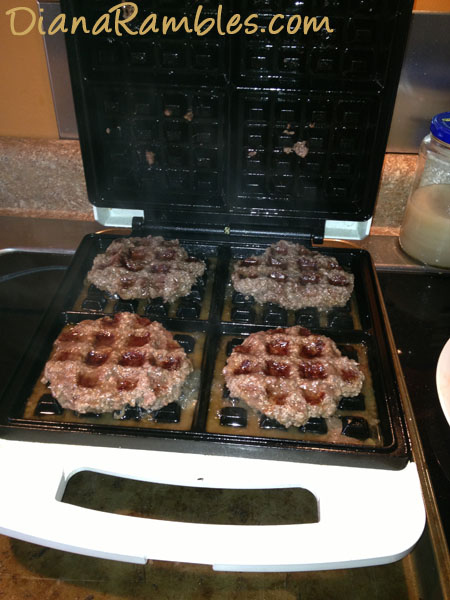 You can actually cook hamburgers in your waffle iron!! I found this really good article that shows all kinds of stuff you can cook on your waffle iron. Seeing is believing. Check it out. I wasn’t too sure about all the things, but you know, it does make sense. It’s also good to know how versatile a waffle iron can actually be. This definitely goes into the category of learning something new. So I’ve fulfilled my quota for today. I’m really delighted to learn this. Also, you may already know this, but some of these waffle irons comes with pancake plates, so you have a choice of pancakes or waffles. That’s really cool. Please check out the article. Hopefully, you’ll be as delighted as I was to see all the things you could cook in your waffle iron. Some people are really clever and don’t mind cleaning up a mess if their little experiment doesn’t work. That’s why I don’t come up with clever ideas — I don’t like cleaning up messes . . . and I’ve made plenty of them over the years. It was always a treat to have waffles at my house. It was cooking at the table which was so very strange to me, but it worked and there was always a fresh supply of hot out of the waffle maker waffles for us to enjoy. Appliances have really come a long way over the years to fulfill our needs. First, I didn’t think I had a niche for this website. I refer to it as “my fun website” or my “kitchen junk drawer.” And I do mean the last one quite favorably, because where would we be without a junk drawer for all those odds and ends we don’t know where to put otherwise. I was writing a post today on one of my niche websites and it dawned on me that I do have a niche, of sorts. I share a lot of recipes and I do get into the holidays and share whatever is of interest to me. I love the free paper craft printables I share regularly. I’ve pretty much created a niche for myself. Just as others have done with their websites. You see, we don’t fit neatly in a box and our websites are a reflection of that. Second, I have many interests which are directed by what’s going on around me. Yes, I have broken my original TwoCansOnAString.com website into 4 niche markets, but this website is still eclectic. It’s kind of like Grandma’s attic. You never know what you’ll find. I’m not sure what was so fascinating about Grandma’s attic. I loved climbing the stairs as a child. I also liked the opportunity of being invited into an area of the house where I wasn’t permitted to explore on my own. It may have been the stories. Everything seemed to have a story. It was best when my grandmother and her sister forgot I was there and they’d reminisce about their childhood and the funny antics of their brothers and even those of my father and uncle when they were growing up. That’s what I want to bring to TwoCansOnAString.com, that sense of family and remembering all those precious moments of long ago and bring them forward to enjoy once again. We do have our own stories that are unique to us, but there is that overlap where we do have memories in common centered around cooking, a holiday, a sound, a fragrance or special or not so special event. It’s that human connection that makes this website fun and special for me. Third is the building of relationships. We haven’t met formally in person, but we do know one another by the time you’ve spent here. I’d know you a lot better if you’d leave me a comment, but I can still relate to you. We have made a bond of sorts. You come here to see what’s new — what I have to share with you. It may be something you like or it may be something that doesn’t interest you at all. But, it is nevertheless a place where you come to visit for awhile. 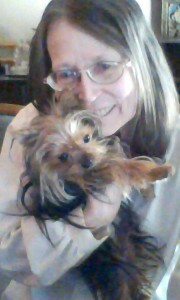 Where I share the weather, my precious Diva, random thoughts and things I found interesting. I do like sharing recipes. Most of life is centered around food. What’s fun for me is making the recipes unique. Not just for me to share, but to imagine what ingredients you’d add or substitute. Or what pops into my mind . . . or yours for that matter that would make the recipe unique for you to share with your family. I sometimes think about a can of something I bought and don’t know where to use it . . . then a recipe comes along that will work out nicely with that ingredient. This may not be the best way of selecting recipes, but it’s a good way to use what’s in your pantry or refrigerator. Fourth, there’s the anticipation of holidays or the change of season and what can be learned from that. Just the other day I learned I’ve been using the term Indian Summer wrong. It doesn’t bother me to be wrong. It’s an opportunity for me to learn something new and share it with you. Quite honestly, why are we online? Isn’t it to learn something new that we can then share with friends and family? That’s true for me and also for me to put here and on my other websites. I’m always wanting to add something new to my websites. Today, I learned we may get some rain. I was a bit surprised when I went outside and saw that it was overcast and not as hot as was predicted a few days ago. I guess it is true, the best way to predict the weather is to go outside. Well, I’ll believe it’s raining when I experience it. My websites are actually no different from the department or grocery stores that anticipate season change and upcoming holidays. Well, I don’t have inventory to put on the shelves and I didn’t have to place orders in advance, but I have been saving some posts to publish closer to the season. This may surprise you, if you’ve been following this blog regularly. I’ve touched on Halloween and Christmas. Yes, it may be my excuse of giving you time to prepare, but you’ve probably guessed that it’s because I’m just like a kid — I can’t wait. Fifth, I love paper crafts. I love printing them out, cutting them out, folding and gluing pieces in place. It amazes me how it does come together nicely. It’s also a good project to do with the kids. They’ll learn how to follow directions and in the end have something to show for their efforts. Since we’re into Back-to-School mode, I wanted to add this great Skoolhouse from Ray Keim’s Haunted Dimensions. 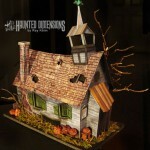 He also has some other great houses on his website you may enjoy printing out and making for a special Halloween display. As I remember he has a lot of Disneyland/DisneyWorld buildings along with The Bates House from the old Alfred Hitchcock movie Psycho. There’s Amityville, too. And he has a new one of The Colonial Theater where the classic movie The Blog took place. These are all excellent, but I’m excited about the old Skoolhouse — although mine didn’t look like this, I can relate as you and your children can. School was a huge part of our lives and will be part of your children’s lives for quite a few years. I was going to add a few more, but sometimes it’s best to stop before I go overboard. Thanks you for stopping by and reading this post. Please leave me a comment. Yes, yes, I know it’s August, but you can never begin too early with your Halloween decorating ideas. Goodness!! You can go creepy, funny or cute; scary, disgusting or thought provoking. I think if I went to so much work decorating a pumpkin I would go with an artificial pumpkin that I could pack away and bring out year after year. 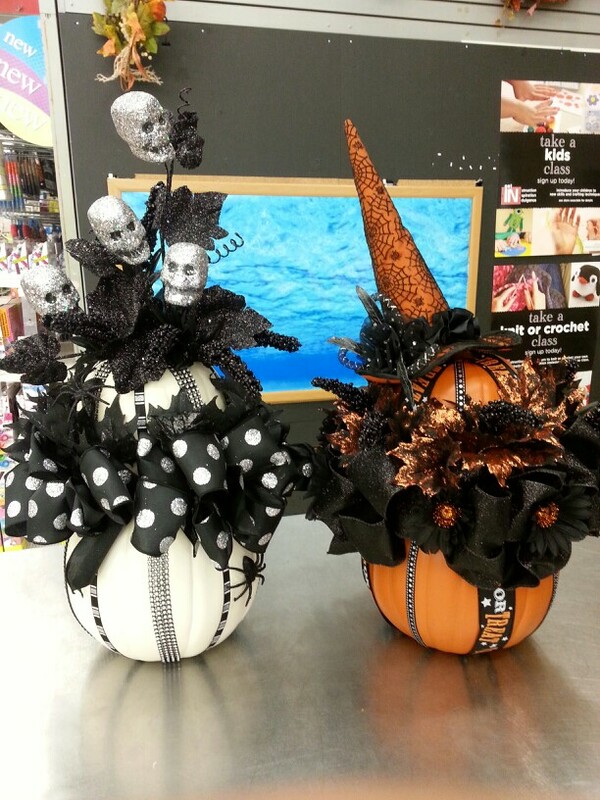 And as long as you’re at a craft store, you might as well take a good look around for various elements you may want to set on top of your pumpkin. This idea is definitely something you may want to keep in mind while you’re shopping. You never know what may catch your eye. And be sure to shop for bargains. I’m usually not one to go to the dollar bargain bins, but I’ve found some real treasures that no one else wanted and it was perfect for one of my holiday projects. Sometimes it’s nice to have something in mind, but it can be quite refreshing to throw caution to the wind and collect things to your heart’s content and see what great creation materializes for you. You can also use some of the free printables I’ve posted here. A pumpkin may be just the right setting. Take a look in the archives. I have a collection of houses, boxes and wreaths, cakes and cupcakes — everything can be fashioned in other media to put on top of your pumpkin decoration. Have fun and leave me a comment below.